“Understanding users better is the holy grail in e-commerce.” A phrase used over and over again. While there are qualitative ways like conducting focussed group studies, surveys and customer interviews, there is always a quantitative way of looking at user behavior. Something that most of the marketers do not give due importance to. Read on to know what you should be tracking and see what your data can speak. In 2015, India met with an onion crisis. The shortage of onion supply took a toll on the common man, as onion is an essential ingredient in almost every dish they make. The decrease in supply led to an inflation in the price. The onions were on a runaway price; at one point they had escalated up to Rs 100 per kg! And people went crazy. Amidst all the hullabaloo, Bengaluru based hyperlocal startup Ninjacart and Delhi based SRS Grocery started selling onions at Rs 1/Kg. They made use of predatory pricing model for gaining traction. Needless to say, they were the talk of the town and got a ton of orders. They came across as a sign of relief in this desperate time of need. Pratik Jindal, CEO of SRS Grocery said that their philosophy is to invest in the consumer and bring them the best deals. While the Customer Acquisition Cost was a lot higher, the aim was to make users aware of their portal. The idea was to build trust and reliability so that users revisit their store and convert. Ninjacart’s co-founder, Ashutosh Vikram said, “We want people to experience our app and this is one of the marketing strategies for us”. This strategy worked splendidly well for them. But the story doesn’t end here. The actual journey, especially on an e-commerce store, begins when they start tracking if those new visitors have returned to their store and made a repeat purchase. Even for Ninjacart and SRS Grocery, it would be a win, if the users who were attracted to the discounted onion prices, chose their store over others the next time they had to buy something. In an e-commerce store, it is important to segment users acquired using specific marketing campaign and analyze their behaviour. This is best done by using cohort analysis which is super helpful for looking at usage pattern, trends and how user behave, helping you visualize the bigger picture. Marketers have access to huge volumes of data. Unfortunately, very few are skilled to analyze it and extract insights and actionable out of it. Sometimes qualitative data tends to take you for a toss, people are inclined towards writing what they think is right and not really answer the questions subjectively. Qualitative feedback is often plagued with cognitive bias. Humans are inherently biased and these biases impact the decisions that we take. These biases lead to incorrect data. Qualitative data sometimes tend to be biased and users sometimes fall prey to false memories. It is always safe to put your bets on something when you have hard data to back it up with. There are no assumptions, no biases, just clear-cut information about the behavior of the customer. Well, it is difficult to put emotions into a spreadsheet. In 1921, a Guardian editor wrote, “Comment is free, but facts are sacred.” Get your numbers right to serve your users better. The best way to analyze is to merge both qualitative and qualitative data to make sure you are on the right track. But for it to really work wonders, you first need to segment your users and then reach out to them with a personalized approach. Only then will the data have significant value. Personalization has been the talk of the town for over 2 decades yet each day, we get spammed to death by campaigns that are “One size fits all“. Targeting the right customers with the right campaign becomes critical when it comes to a providing a great user experience. Everything you need to know about personalization and how you can boost sales is covered in this article, give it a read. To personalize, you need to know more about your customers. You need to start looking a the gold mine of data that you sit on. We have already covered how you can start using Google Analytics in our earlier article. Definitely go through this article to understand how you can make use of Google Analytics better. You can also consider importing segments from gallery. You can have a look at ready to use segments that Avinash Kaushik has created and see if can help you in tracking users better. Segmentation helps in understanding users better and targeting them with campaigns that would resonate with them. A mistake that most of the marketers do while segmenting, is that they end up segmenting visits, and hardly segment ‘visitors’. After Google released a better version of their segmentation UI, you can not only check repeat visits but also returning ‘visitors’- which is a better way of segmenting as there is always a significant gap between the two. Here is the first level of segmentation you need to look at to get a better idea of your audience. Here are 5 additional segments which would help you differentiate between your power users and your normal users. Demographic segmentation - Attributes such as age and gender come under this. Geographic segmentation - Attributes such as city, country, language all are accounted in this. Device vice segmentation- The type of the device that users make use of while browsing your website will be reflected. Segment users based on Desktop, Mobile, and Tab. Psychographic segmentation - This segmentation focuses on the Interest of the user. Here you can identify where the interest of the user lies. Channel vice segmentation- See where the users come from and which channel give you the highest revenue- is it from organic search, from paid campaigns, direct traffic or referrals. What you also need to realize is that while some channels might directly contribute to sales, they play a major role in assisting a sale. Here is an article you definitely need to read to attribute the right channels. 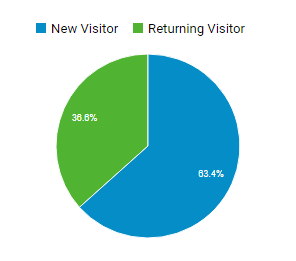 You can easily see if more purchases are done by ‘New visitors’ and ‘Returning Visitors’. You need to keep tabs on the frequency of the purchase as well, to know the average time a user takes to convert. Find out who makes more purchases. Create campaigns that will help you convert the other group better. Are you engaging with the new visitors? What can you do to retain users? Note- You can also go ahead and compare this with the site average of a particular segment to understand better. Here you can know how many sessions does it take for users to convert. For example, not every user converts on the first go, some like to do a bit of research, some would compare prices and well some would wait for their salaries to be deposited to their account. With this report, you will get to know the trend and plan your marketing campaigns to accelerate the buying process. You could also check days since the last transaction, giving you an idea as to the duration users take to return to your store after a purchase. This will help you realize the right time to send out retargeting campaigns targeting dormant users. With this, you will be able to check out the performance of the cart recovery campaigns, tweak them and see how they are performing. Some marketers end up tracking the wrong metrics. You need to track the right data to reach out to the right crowd. Objective - To understand how your users consume content and products on your website and how you can use that to create a better and delightful experience for them. For example, when a user lands on your store, the data gets recorded as a ‘hit’, which is a user based interaction on the website. All the page views and events get recorded as hits. A session is the summation of all the hits (interactions) that users perform in one visit to the site. With this in mind, let's dive in! While we have always been glued to vanity metrics such as traffic and unique users, you need to think beyond them to get a clear cut idea. Don’t get me wrong, these metrics are important, but as Avinash puts it- "All data in aggregate is crap". Before you start off, you need to realize that engagement is directly impacted with the time it takes for your website to load. Every additional second it takes to load the site, increases the bounce rate by 65%. The benchmark you should follow is to load your online store under 1.5 seconds. Make sure that you run a check on all major devices. Optimizing on mobile is not an option anymore. The question now is not if you are optimized for mobile, but how fast it loads on it. Progressive web apps is something that you need to look at to provide users with a smooth user experience. Alibaba.com, after implementing Progressive Web Apps, saw a 76% increase in total conversions across browsers. Website design plays a crucial role in reducing the bounce rate as well. Check out this article to know if you making these 6 deadly website design errors. Once you have these in place, you can have a look at your engagement metrics. You can also go ahead and directly compare average session duration and bounce rate to get better clarity. To observe data from a granular level, click on performance and choose sessions and session duration as shown in the image below. The number of pages a user visit show that you have successfully got their attention and they are interested in the product on your store. What you need is to keep tabs on the average pageview and the bounce rate. 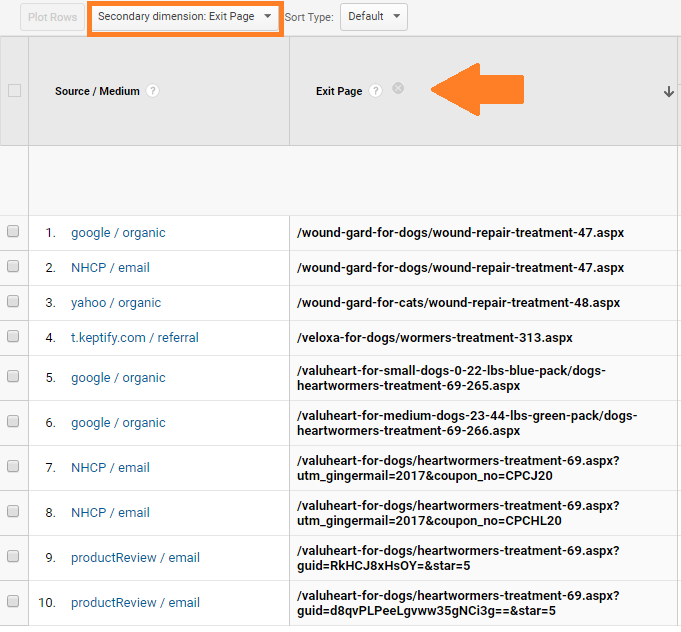 Add a secondary dimension in Google Analytics to know which is the ‘Exit page’. Figure out why users are dropping off from this particular page. Are the buttons not working, images not rendering, or is the page cluttered? Repeated views of a single page are counted in the average page view. What you need to keep in mind is that average page views vary over time. For example, you can expect a lot of users buy Red apparels during Christmas. But once the holiday season gets over, the trend changes. You need to keep an eye out on the exit pages to know where the user drop off from. This helps you identify the loopholes and work on it. To get finer data, move to Audience > Behavior > Engagement, to know the sessions and page views. Then you can go ahead and apply this to the average session duration. Add a chatbot, encourage them to chat. It also gives them an opportunity to clarify whatever that is making them close the tab. Add most bought products on that page, add reviews and testimonials to encourage users to stay back and make a purchase. Cohort analysis is one of the most powerful ways to track user behavior, but the most ignored as well. It helps analyze a group of users rather than your entire user base. A cohort is a set of users who share common characteristics. Analyzing the behavior of these groups is called cohort analysis. This helps is analyzing users over a period of time and compare different groups to know different trends. Cohort analysis helps to identify which behavioral changes let to different results. With Cohorts, groups are based on a user’s first visit to your store. This helps you track the user’s behavior from day 1, check the average conversion velocity (time taken for users to make their first purchase), optimize your campaigns accordingly and observe if there are any changes. The downward trend is normal as returning users reduce with time, and there is no need to get frightened. With this, you will get to know how many customers return to your site and make repeat transactions. According to your goal, you need to choose the right metric from the drop-down menu. You can also change the date range and cohort size. Then, go ahead and add a segment to this, for example, let’s say you want to know how many users from Organic traffic return to your website, this report comes in handy. Adding various segments will also help in comparison of the cohorts. You could add Bounced users as a segment and see how many browsed more than 1 page and how many did not. To know how the conversions look like, you need to have a look at user buyer journey. Conversion Path helps you realize where the user started off from and the channels that assisted in converting and the channel that finally helped convert. This helps in reducing attribution fallacy. If you have not read the article I mentioned above, that talks about attributing the right channels, now would be the right time. This report helps you know the number of times users interact with a particular channel before they convert. In the above report, you can see that the third most common conversion path is when users visit the website 2 times via paid search. Identifying the channels help you to focus on the right channels and experiment with different campaigns. 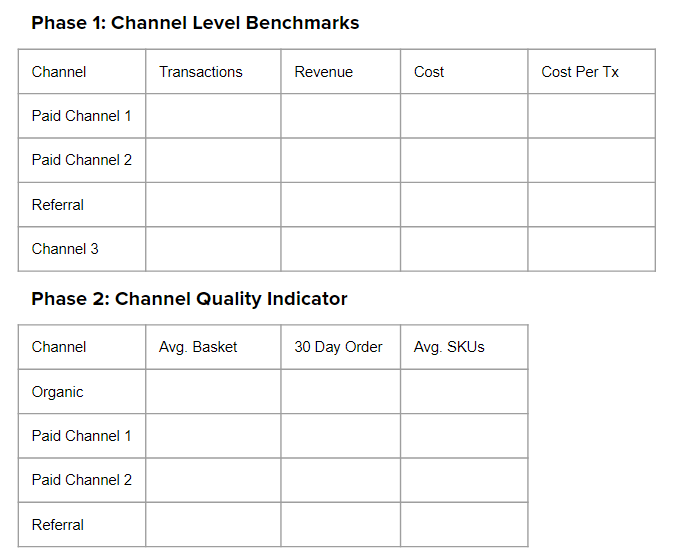 To identify specific channels you can go ahead and add it to the report, to know where the channel comes into the picture. You can go one step further and include source path as well to know where the users came exactly. This report helps to see the average length of a sales cycle. The time lag in days is mentioned so that you get to know how many conversions resulted in the conversion path from 0 to 12+.